Can you believe it? 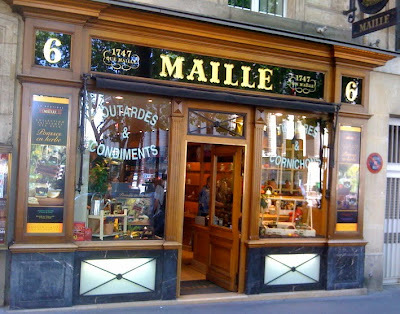 An entire store devoted to mustard. Some yummy recipes plus a $1.00 off coupon. And this week (August 11-17) Harris-Teeter is doing "Super Double Coupons"--they're doubling coupons up to a face value of $1.98. 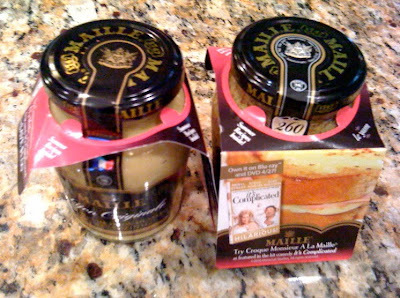 I just bought these jars of Maille mustard for $1.49 per jar ($3.49 sale price minus $1.00 coupon doubled to $2.00 off). If you've been wanting to try a delicious gourmet mustard, now is a great time to give it a go! How I wish I were in Paris, and how I wish I were there, so I could go to Harris Teeters! I think that calls for a hot pretzel! yummo! I love mustard. When I move to SC, I will have a Harris Teeters. I can't wait. Paris? You lucky gal! Sadly, the closest Harris Teeter is 50 miles from me. You sure got a good bargain on this mustard. great little deal on a memory from across the sea! i've never tried it before... but if i get to the store to restock my fridge today i'm gonna look for it! just catching up on all i missed while i was gone :) missed you! Hi, Richella, how did I miss that you had been to Paris this summer?! Wow, lucky you, I must go back & check out the pics. I was there 20 years ago & it was just fabulous. And no, I don't remember you telling me you lived in LP either! Small world. My friends all live in the same little neighborhood & I think it's great that they are so friendly with each other. My neighborhood is not, haven't figured out a way to change that yet. LP is a huge place, that's for sure, but it does have a nice feel. Thanks for coming by with your positive comments, I always appreciate it. So I just went back to find your post & oh my, the memories. I also visited Versailles & hung out by the Arc and went up in the Eiffel Tower. How fun it was! !